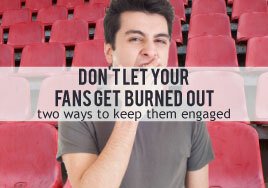 Are you worried about fan burnout due to often-repeated gigs in the same venue? Are your fans tiring of you? While they seem like nice problems to have, they are legitimate concerns we’ve heard artists bring up. Read on for our take on this topic. I remember being out on a couples’ dinner date recently and watching with amusement as my friend Bob began to tell a funny story about his past. Bob is a great storyteller, truly gifted at communication. He has a knack for including just the right amount of detail in the story, and his timing with the punch line is excellent. Bob seems to have a million stories, and he enjoys sharing them. Everyone was having a good time listening to Bob. Well, almost everyone. Teri, his wife, was not quite as enthusiastic as the rest of us, and she rolled her eyes back as Bob began the story. Now, Bob and Teri have been together for years; they get along really well, are a very compatible couple, share common interests, and love being together. So, why was Teri less enthusiastic than the rest of us? Well, Teri has heard all of Bob’s stories many times, and she considers them counterproductive for the group discussion. She thinks Bob is funny—it was one of the reasons she was attracted to him so many years ago—but his material needs updating. Bob does tend to repeat himself, and not just to Teri; the other couples with us had also heard many of his stories. Nonetheless, Bob enjoys performing, so the show goes on. Like Teri, I can only hear the same thing so many times before it begins to wear on me. It might have been engaging, interesting, or funny when I first heard it, but after a while I yearn for something new. The excitement is gone. When we go to dinner with Bob and Teri now, we have to prepare ourselves to endure some of Bob’s repeat performances. I hate to admit it, but I’m starting to feel just like Teri. Overexposure to music can have the same effect. A hit single is incredible the first time I hear it. It’s fun to listen to or share for a few weeks. But then, when I hear it on every radio station, on the evening news, and as I do my grocery shopping, it becomes downright annoying. After a while, I just want it to stop. As an independent musician, you face the same challenge Bob faces. Great material helps win loyal fans, but performing that same material over and over, without adding new material, can help you lose those fans. Fans want more new music. Otherwise, repeating your limited library of hits will wear on them. Your success as an artist can be impacted negatively if you do not produce new music consistently. New music creates new sales and keeps things exciting and fresh, for you and for your fans. When I get a notification from a favorite musician that they’re releasing a new single or album, the anticipation of hearing their new music for the first time gets me excited. Depending on the artist, I’m ready to purchase the album from the first mention of it, without waiting for reviews and previews. Your fans are the same way. Don’t frustrate them with outdated, stale material. Ashley and I were having a discussion recently about her career. She had been performing in our area for some time and had some concerns about fan enthusiasm at shows… mainly that it seemed to be waning. She also felt that her connection with the audience was less than what it used to be. Ashley had a revelation. “You cannot be a prophet in your home town,” she told me. Ashley felt that the local fans were too familiar with her and her music. They no longer recognized her talent the way they used to. They were not engaging with her. In addition to her revelation, Ashley had a plan. The plan was to move into new markets where people did not know her, book new venues, start a new promotional campaign… you know, change things up a bit. She would be fresh and new; the old buzz would be back. Well, maybe not just yet. Let’s back up just a little. Ashley is a good songwriter and quite a talented performer. But the new digital age of music, with all of its opportunities and overhead, was overwhelming her. She was doing everything. Shooting high-quality music videos, expanding her merch line, updating her websites, tweeting regularly, signing up for social media accounts left and right, and posting her music on every possible digital download store and streaming service. She even traveled to SXSW to hear what the ‘next big thing’ would be. Ashley spent 30 to 35 hours per week on the ‘business side’ of her music and the rest of her time traveling to and performing at her gigs. In short, she was doing everything she could think of to feel and look like a successful performer, hoping that it would make her one and bring hordes of fans in to purchase her music. The reality was different. Most of her fans didn’t visit her website, since there was no new music, and her social media posts vanished into fans’ feeds as soon as they were typed. Her video, which looked great but cost thousands produce, only had 220 views on YouTube. And, instead of buying her music, most of her fans were streaming it online for free. Ashley was dedicating way too much time and energy to things that didn’t really matter—or, worse yet, hurt her. Ashley looked great and was busy doing stuff, but nobody noticed. Does this sound like you? Doing everything you know how to do and implementing a strong plan but coming up short? Have you figured out why? We have. Ashley was so busy doing the ‘business of music’ that she forgot about the music itself. When Ashley was first starting her music career, she spent 90% of her time working on her music and developing material. Now the tables have turned. Ashley has not released a new album in over three years. She wasn’t developing new material with any regularity because her schedule was too busy. I remember a recent four-day period where she performed seven times in five different cities and spent 16 hours on the road for travel between gigs. I don’t know how she had any energy left to perform! The point is, she now spends 90% of her time either performing or engaged in the ‘business of music’… and she hasn’t even noticed the change. This happens quite often with talented, creative people who also have to run their own business. They get into music because they have talent and love writing, playing, and performing. But before long, their focus has shifted to building their career, and they end up doing everything but creating new music. The result? Your music and your career suffer. Number One: Ashley is full of creative ideas but has allowed her schedule to rob her of time to work on them. This MUST change. Think of the fan response to Ashley if she had released 3 new albums over the last three years along with several singles, EPs, release parties, and some promotional products. She would have done much better with her fans! Fan excitement and engagement would have been much higher, let alone the income generated. Of course, we know that life is not that clean-cut. If one week or day demands more time for gigs, she should balance things out when she can. Maintaining a balance is key. It would also be helpful for Ashley to set a minimum goal for creating new music. One new single to release every 6-8 weeks and one new album each year would be a good place to start. Number Two: Ashley needs to look at her current venues and determine what is or isn’t working. Let’s look at that four-day tour. Her income on one of those gigs was just $250, and she had to travel two hours each way to make it. As it stands, it’s really not worth the trip. Her other out-of-town gigs were further away but paid significantly more, making them worth her time. And her gigs in town paid well. Once Ashley has determined which venues aren’t working, she can decide if they need to be cut altogether, or if they just need to be booked differently. The low-paying out-of-town venue on her four-day tour needs to go, or she needs to book additional venues in the same area to make the trip worth her time. If Ashley cuts venues from her list, she can think about replacing them with new venues, as long as they pay well and expose her to a receptive audience. Touring is another option, but she’ll need to be strategic and selective about where she plays. This might be a good time for her to hire a professional booking agent. If they can open doors to the right venues and help her organize her performance schedule, a good agent is well worth the money. She should try to negotiate an agreement that keeps her involved in the relationship with the venues, allowing her to personally handle the relationship after an agreed-upon period of time. In the end, Ashley was partially right. She did need to change things up by expanding her venue options and purging those that don’t work for her. However, she was also missing something that was even more important: the need to make creating new material a priority. Ashley needs to dedicate a significant portion of her time to creative development. Going on tour with old material will not solve her problem, at least not long term. Getting back to her creative roots will. This is one of those posts that should be bookmarked, and read again.. Every musician needs to be reminded to get back to songwriting and recording. New material is important, not only to the fans, but for me, I am more excited about performing new music! Even one new song added to a set from time to time can change the dynamic of the gig! Thank you, Terrance. We agree, and we’re happy to hear that you make an effort to keep adding new music.